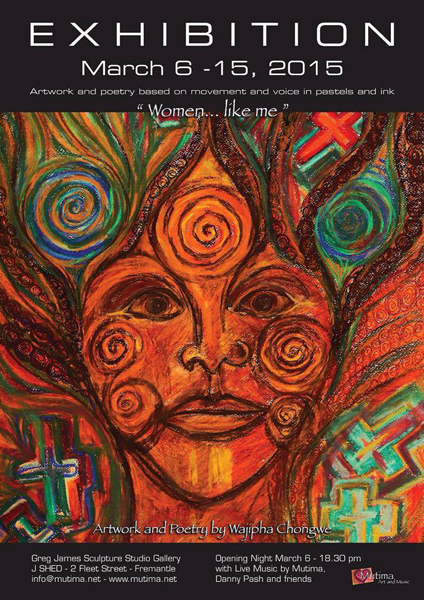 WAJIPHA CHONGWE is returning to Arthur Head with her show Women….like me, an exhibition of pastel and ink paintings and poetry, based on movement and voice, at the Greg James Gallery at J Shed. Wajipha started the first new gallery-MUTIMA– at 11 Captain’s Lane when the Bathers Beach Art Precinct was established and the name continues as a band with her soon to be husband Freddy Poncin. The opening is on March 6 at 6.30 with music by Mutima, Danny Pash and friends and a limited edition of prints and graphic poetry books will be for sale.